This board is a great fishing platform. So stable, tracks great, and has tons of room, the rigging possibilities are endless. Yes it's a little heavy but the thing is practically bulletproof. Worked great for stalking reds on the flats. Thanks to AKC for the great service in regards to the shipping, arrived on time and undamaged. Overall I'm very pleased. Can't wait to chase tarpon with it this summer! This is my first venture into paddle boarding so I don't have anything to compare this to, but as a fishing platform, this board is awesome. So stable, tracks great and has tons of room for gear. Rigging possibilities are endless. Yes it is a little heavy but the thing is practically bulletproof. Really worked well for stalking reds on the flats. I would recommend getting the wheels that clip in the finbox, made transporting a breeze. Thanks to AKC for the the great service in regards with the shipping. Overall I'm very pleased. Can't wait to chase tarpon on it this summer! This is a great fishing oriented paddle board for the price. It is not fragile, can carry a lot of weight, is extremely stable, and you can fish off of it with ease standing or sitting. The dry boxes are handy. You won't win any races but flat, fish infested waters it is excellent. It is very heavy. Two person lift is a necessity except for the strongest of people. 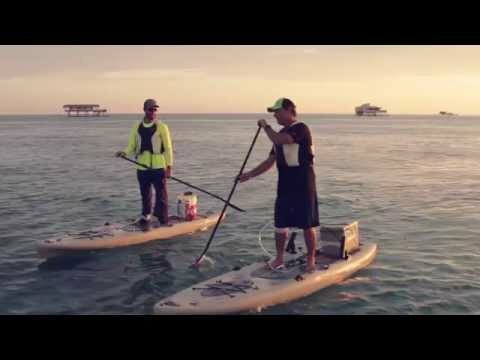 It doesn't get carried under your arm like other paddle boards. The transport wheels the company offers could be the answer to transport. Once in the water though there is no problem with maneuvering. YES, This is a heavy board, but Oh, My God what a huge amount of storage, deck space, and features! Paddles like you would expect, slow and steady, but also can handle waves and chop with easy and minus the familiar hull slap of typical paddleboards. If you want a board that can do it all and last forever, this board is good money spent. In a pinch, it can transport my girlfriend, daughter, dog amd I with ease. NO other 11" board has the load capability of this beast, it is a literally amazing! It's a little heavy, but other than that, it's great! Super stable, definitely worth the purchase! 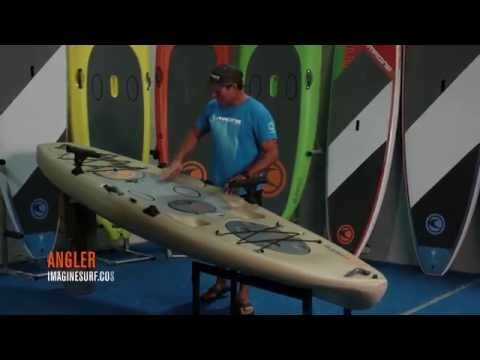 A: The grey was only for the Wizard model, they have since came out with a version of this board that is just called the "Angler" and grey is not available in it. It looks like we are out of stock in the grey for the Wizard. Q: Is there a way to rig a cooler for a chair without drilling, and which one would you recommend. A: Unfortunately there is no way to rig a cooler or chair securely without drilling. You could try a Larry chair for this as it might work for the board, but both a cooler or chair would need to just sit on the deck of the kayak. Q: i am seriously considering buying the wizard angler but the only thing that is throwing me off is the color, does it come in any other color than the sand brown? A: Unfortunately at this time the only color available is the Sand.